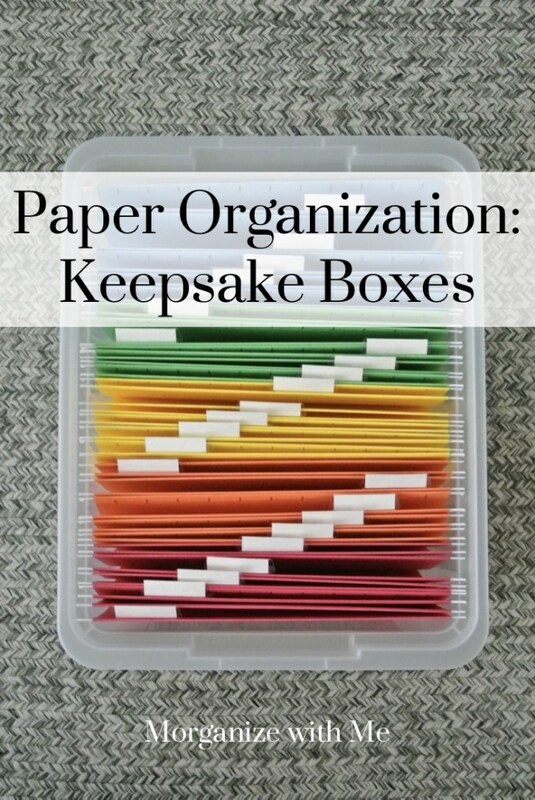 The following is a guest post on how keepsake boxes can be used to organize 5 different paper piles from regular contributor, Morgan from Morganize with Me. When helping my clients reorganize, downsize, and minimize, I come across A LOT of paper. So much paper that I’ve been curious how much paper is still floating around in our now mostly (from what it seems) digital age. 700 pounds! Ok, now I feel better. Not better because of the number but it makes more sense to me why so many people are still struggling with paper chaos and clutter. 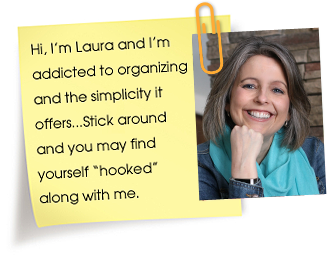 Are you ready for an easy to implement paper solution? It’s time to rethink the Keepsake Box. Let me explain. A “Keepsake Box” has been traditionally used for child memories, all things childhood and school related. I set up one for each of my ABCs and they work fantastic to keep all of the memories contained and of course, organized. But guess what? This simple system would be perfect for so many other categories as well because it can be adjusted however necessary. I’m going to give you several different ways to implement Keepsake Boxes for all things paper organization. Like I mentioned this is the “traditional” way I use them. You can print a free printable HERE (along with many other free printables) that lists a selection of file folder labels for your convenience. Setting up a box like this while your kids are young is such a great idea. The number one paper struggle (from what I see) is managing the incoming and outgoing of bills, statements, and the like. Organizing a “Bill Box” would be a fantastic way to streamline the process. You could set up a file for each vendor or company you pay regularly and/or create file tabs for the payment due dates such as – week one, week two, week three. You can go any direction with this theme. Whether working on a big project like a major house renovation, or helping your high school senior decide between their top 10 college picks, or even planning a wedding. A “Project Box” could be a life-saver and a way to help you keep a place for everything, and everything in its place. While children certainly have many memories, so do we as adults. Setting up a “Life Box” would be an excellent way to better coordinate where you hold the things that you want to save. I personally keep things like this organized in our hope chest but having a file system for those items you want to save, such as treasured cards, special photos, articles, or information would be a great way to know where to put what where. Looking for a place to keep all things holiday related? A “Holiday Box” could be just that! Have a favorite Valentine’s Day cookie recipe? This could go in the Valentine’s Day file. Want a place to tuck away your favorite Christmas cards that you’ve received? There could be a file for that too. All your Thanksgiving recipes in one place – check! 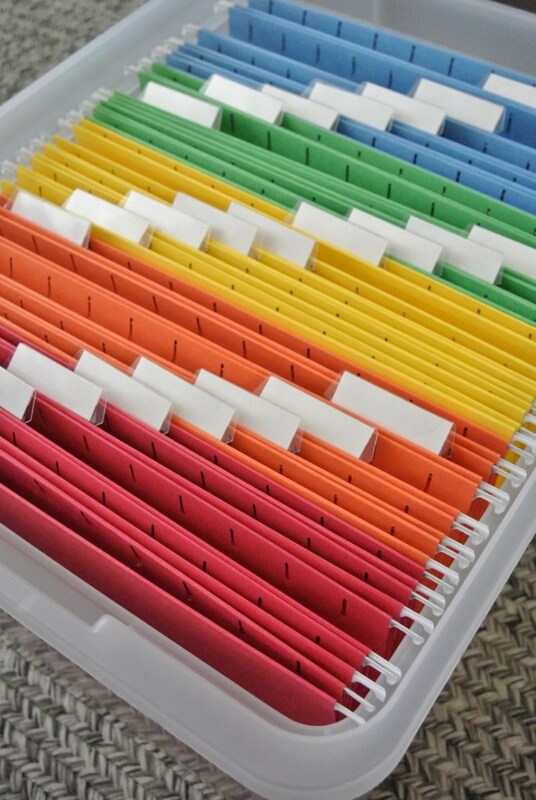 Never underestimate the power of a file box. But as I say this I also want to encourage you to keep a very BIG picture mind-set. Don’t keep paper just to keep paper. Move digitally as much as you can. Be realistic about the time and energy you have to be able to sift and sort through things. Remember, sometimes the most refreshing way to deal with unnecessary paper is to simply recycle it! Not sure where to recycle? Check out Earth 911. When I first saw the title about “Keepsake Boxes” for “Paper Piles in Your Life” I pictured either cardboard bigger-than-a-photo-boxes, or maybe those 12 x 12-inch plastic craft storage boxes. But am I correct that these are all ideas about filing –in individual file boxes rather than a tall, maybe 4-drawer file cabinet? I already [try to] use those to separate my own paperwork from that of an older relative whose finances I oversee.